If you’ve been in a camera store in the last couple years, you’ve undoubtedly seen Joby’s Gorilla Pod line of tripods. You know the ones – with the funky legs that wrap around anything. Joby is going to make your life simpler with this new product. Super lightweight, it folds flat enough to take up hardly any room in your camera bag or pants pocket. Folded, it’s only 7” long and about 1” in diameter. The weight is only 2.8 ounces. Heck, your computer mouse probably weighs more than that. Just like it’s big brother cousins, those ball-jointed legs will bend to grip onto most anything. Even better, the feet are magnetized for a surprising amount of gripping strength. Common sense says not to put your camera on the hood of your car and enter the freeway, but chances are it would work. I used it recently to shoot video of myself while working on my laptop. I was able to bend two of the legs to right angles to grab the top of my laptop screen and then moved the third leg to precisely level my camera right above the screen. The main difference with this model is the video head, however. With a full 360 degrees of panning motion, and 135 degrees of tilt action, there aren’t many shots you are going to miss. There’s even a miniature quick disconnect camera mounting plate that you can leave screwed to your videocam so you are ready to start shooting on a moment’s notice. 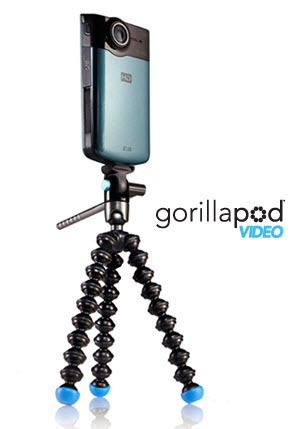 Look for the new Gorillapod Video at your local camera shop or at the Joby website.